Very good movie to watch. Classic Bill Murray summer camp comedy and still one of my all-time favourites. Good movie, but not the best. Was definitely a family movie. 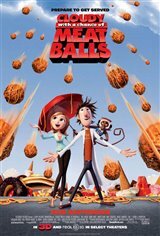 I saw cloudy with a chance of meatballs and I have to say i was pleased with it and it was very funny. terrific, wonderful, awesome! one of the best movies i've seen all year. i liked it as much as my granddaughter. very well done! I have not read the book but this movie was great. My kids are 9 and 4 and loved it. Most original animated film since Monsters Inc. Laughed out all the way through! Five stars! it is so funny me and my freinds laughed through most of it. Laughed and laughed! I haven't laughed this hard at a kids movie. The kids loved it too. Can't wait for the DVD. The previews don't do this one justice. Excellent movie ... even for us adults. Original with lots of laughs. I dont like to not like a movie just to not like it. This movie would have been great for a little kid, all of the "funny" references that were geared towards adults have been done SO many times before. Definitely an original idea and encourages the use of ones imagination, which is much needed for children these days. A great film for the family. I didn't really want to see this movie before when I saw the trailer, but after I read the comments that people saying it is so funny, I decided I'll go see it. Our home family loved it, we laughed from beginning to end. i loved this movie so much it was so funny and cool! Awesome, hilarious movie! Fun for all ages. Great family movie! The movie gives you an appetite and so much more. We laughed and laughed! A must see. I enjoyed it. The plot was interesting enough, the sub-plot about how the weather girl coped was interesting. The animation was smart and funny. 4 stars. It was a pleasant experience! Very great movie. Girlfriend and I enjoyed it a lot. LOVED it! It was entertaining from beginning to end. I thought it was much better than mosters vs aliens, and Up. GO WATCH IT!! So I went into the movie expecting a pleasant time but nothing overly crazy boy was I wrong. What an excellent movie, excellent plot, excellent animation and extremely funny! my buddy and I couldn't stop laughing. I recommend this to adults just as much as to children. good movie. creative and lots of laughs. For those that liked "The Hangover", you just MUST gotta go see this, because it is probably the second best thing after that movie! 5 Stars for Bill Hader's extraordinary performances! An extremely fun and entertaining movie even for adults. Not one boring part! Hilarious and Awesome in 3-D!!!! A Full Price movie indeed! Funniest film ever after The Hangover for this year.